I tried Polleverywhere again after a couple years away from it. Polleverywhere is a system that allows you to poll students using texts, Twitter, web browsers, an app or a combination of these. It has made some big improvements for math. One big limitation, unfortunately is compatibility with WordPress.com so I cannot show you live examples of the polls I made. I’ll try to describe them. One big plus is that you can put images in answer choices now. 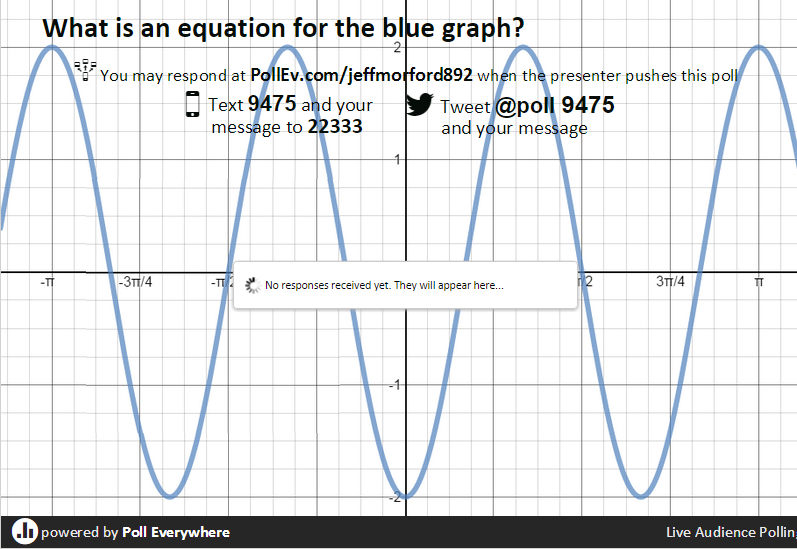 So, math expressions and equations can go in multiple choice answers. You cannot put them in the questions so that is only sometimes helpful. 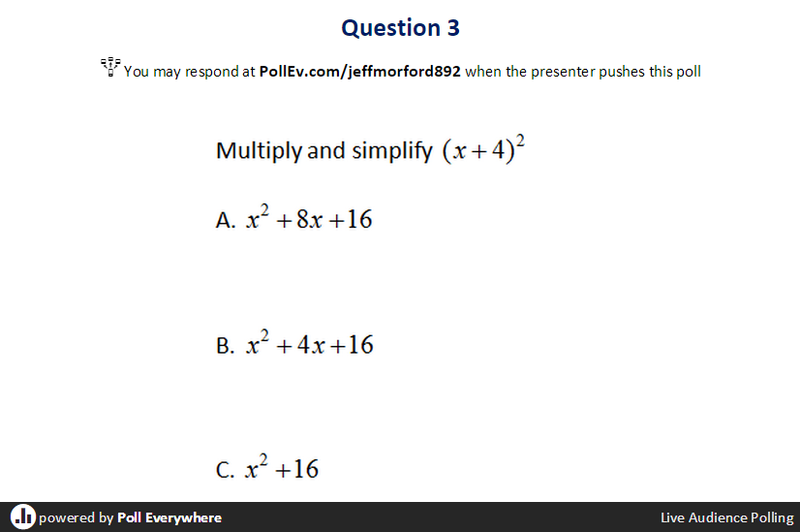 You can also just put an image up as the question and have regions of the image defined for the answers. The drawback to this is that students then must have a smartphone to vote using the browser or an app. You have a lot of control over the voting. For instance I plan to use this for a coin tossing experiment to generate a histogram. I’ll allow each group to send in exactly 5 responses to how many heads did you get when you tossed 10 coins. The other is the ad stating that this is a free account. 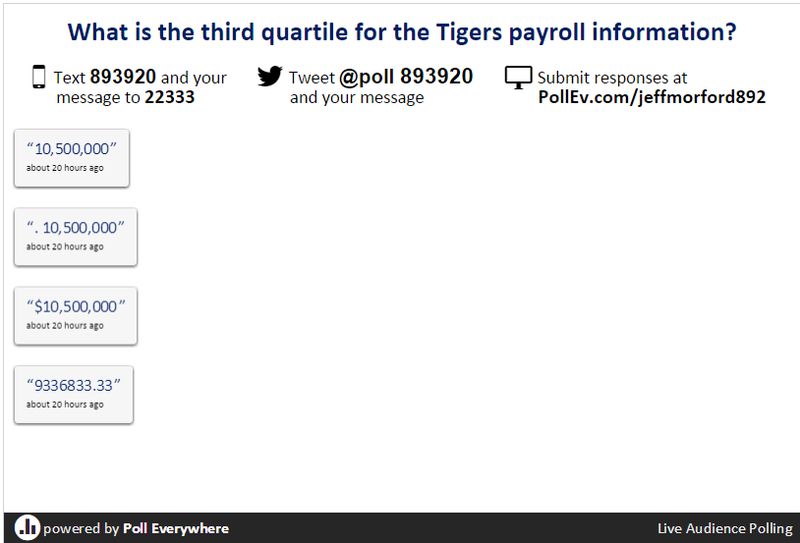 I certainly don’t object to any business model that Polleverywhere wants to use. The small ad that shows in Chrome is certainly reasonable. However, in Internet Explorer the free account announcement is huge and in the center of the screen. It makes the free product unusable in the classroom if you only have access to that browser. Instructors may pay $349 for a semester of polleverywhere to get extra features and the ad removed, or may pass the cost on to students at $14 each. Both of these are a great alternative to forcing students to buy clickers. Both are great improvements over their pricing a few years ago. However, alternate methods of informal assessment are (essentially) free. Unless I decide to build my class around this kind of assessment I think I will stick with the free version and other methods of informal assessment. If I still taught sections of 200 like I did early in my career I might make a different choice.